One of the things we hear consistently from business owners, residents and visitors is how refreshing Eureka Springs is and how content everyone seems with their lifestyle. That's quality of life! Many people relocate here because they have visited before and they just can’t get this town off of their mind. No wonder – the urban stresses of pollution, crime and traffic don’t exist here. The life style is easygoing. The vibe is authentic, creative and cosmopolitan. Eureka Springs has been described as an "Island in Arkansas". It is a small town with a big heart. 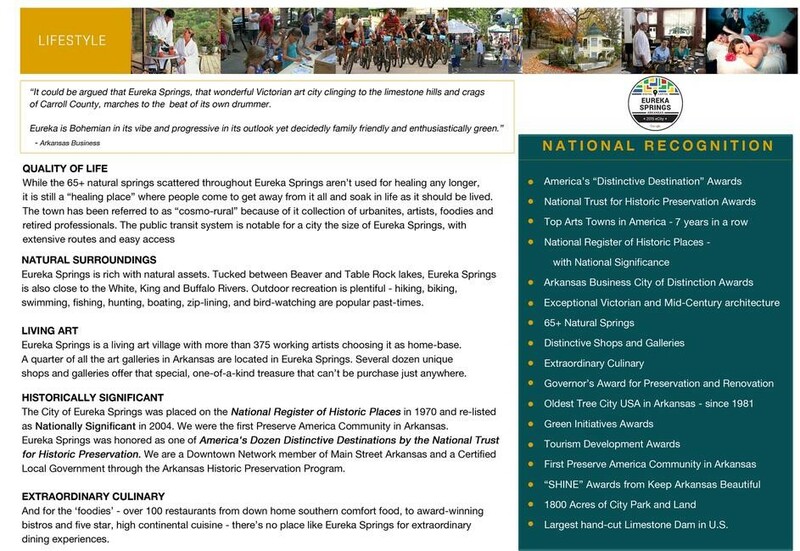 If quality of life is at the top of your list for places to live - Eureka Springs is the natural choice. Eureka Springs is irresistible with four distinct seasons, surrounded by lakes, rivers, streams and mountains, high quality of life, natural beauty and cultural opportunities. Eureka Springs and Northwest Arkansas are literally the center of the U.S., providing easy access and commuting. NWA is the fastest growing region in the country and is now the largest greater metro area in Arkansas. Eureka Springs is great for business and great for life! The “island” of Eureka Springs is rich with natural beauty, art, culture, the finest culinary scene in the region, history, open spaces, preservation, trails, rivers, lakes, green, low-to-know crime rate and a creative economic base and culture. Live in town, right outside of town or on Beaver Lake – your life your way. Entrepreneurship is in our DNA, and regional leaders are committed to sustaining and enhancing an environment that allows innovative businesses to start, grow and thrive. Ideas can become products, virtual services and companies. Our region encourages university research and private sector innovation by building a network of mentors, physical space, shared space and local investors. Keeping your family safe at all times is a priority. 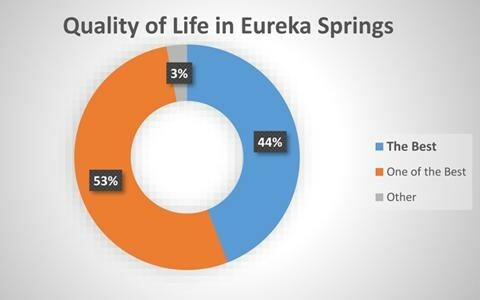 Eureka Springs’ extremely low crime rates makes us one of the safest communities in the United States. Eureka Springs has state-of-the-art telecommunications systems through: Verizon, Cox Communication, AT&T and Windstream. Northwest Arkansas is home to many technology, science and business incubators and centers. Within a 45-minute drive, commuting is easy to Walmart, Tyson Foods, J.B. Hunt Transport Services and many companies in the Fortune 500. Crystal Bridges Museum of American Art, the Walton Arts Center and several museums are within a 40-minute drive of Eureka Springs. Flying in and out of the Ozarks is made easy by having a local airport just 20 minutes away, Carroll County Airport. There are 2 regional airports nearby as well. Northwest Regional Airport in Fayetteville and The Branson Airport just north of Eureka Springs in Branson, MO. These regional airports host major airlines and are both less than an hour’s drive to and from Eureka Springs. Another benefit of Eureka Springs is our wide-open spaces, parks, extensive in and out of town trail system and plenty of water! 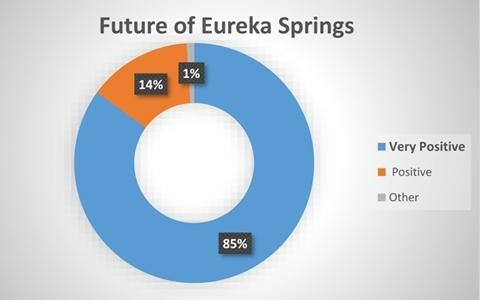 The Greater Eureka Springs Chamber of Commerce, Eureka Springs city officials and civic leaders are ready to work with you to make your move to Eureka Springs. The rolling hills of the Ozarks and idyllic central location means mild weather year-round in Eureka Springs. The four distinct seasons provide visitors and residents with opportunities to be active all year and enjoy life to its fullest. Surrounded by lakes, rivers, mountains, streams and magnificent fresh air, Eureka Springs is known nation-wide for glorious ‘colors’ in the fall.